Here’s another inane sunscreen experiment to break up the heavier content in my last four posts! Kinda like one of the Hulu commercial breaks while I’m watching episodes of “The Handmaid’s Tale.” I wanted to have this post ready for National Sunscreen Day on 5/27, but I wasn’t able to pull it together in time. Better late than never! 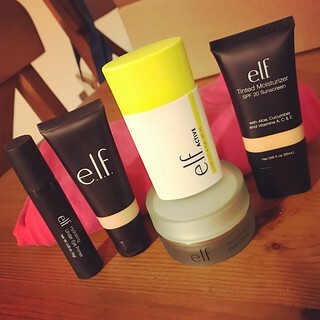 I was torn on whether to publish this post under the header of “sunscreen experiment” or “retail therapy” since I purchased this sunscreen along with a number of other beauty products from the e.l.f. website on 3/25. I really just wanted to buy one item (Hydrating Under Eye Primer), but in order to qualify for free shipping I threw some other things into my cart that seemed promising. I’m sorry to say that most of the products I purchased aren’t working out as well as I’d hoped, but luckily the order wasn’t a complete loss. The e.l.f. Active Stay Out & Play SPF 50 is one of the items I bought on a whim and now I’m so glad I did. It’s similar to a much more expensive product I used a while back (Bare Minerals Mineral Shield Daily Prep Lotion SPF 50, which I think has been discontinued), but with surprisingly superior qualities. This SPF 50 has a liquid texture and feels powdery after it is applied. I was surprised to discover that it also has a light tint and it somehow works perfectly with my fair skin tone. That is not usually the case with tinted products considering how pale I am. I covered my face and neck with this lovely sunscreen last Friday and it got me through a full day at Disneyland with my friend and her daughter. And isn’t Disneyland the real test of any sunscreen? It’s really fantastic. So glad I gave it a chance!